The 66-year-old celebrity had been the subject of tabloid reports of ill health, after he was spotted being wheeled through JFK airport wearing a wide-brimmed hat and clutching a small dog. He said news websites had seized on the pictures as a show of his failing health, with headlines that he was on his "death bed". He said the claims were a "complete fantasy", and accused those demanding autographs of being touts who sold signed goods to genuine fans at inflated prices. After a fan tweeted a photograph asking if he was okay, the actor said he had used the "wheelchair trick" to avoid dealers who "constantly badger me". He later said he had arrived at the airport at 5am and was running and dodging men waiting with 15 film posters in each hand. "You think real fans are there at 5am? No," he said. "So at the last moment my daughter goes, 'Hey dad, get in the wheelchair, take the dog, put Millie on your lap, pull your hat down, let's see if we can do it'. "And of course, click click, it goes all around the world." 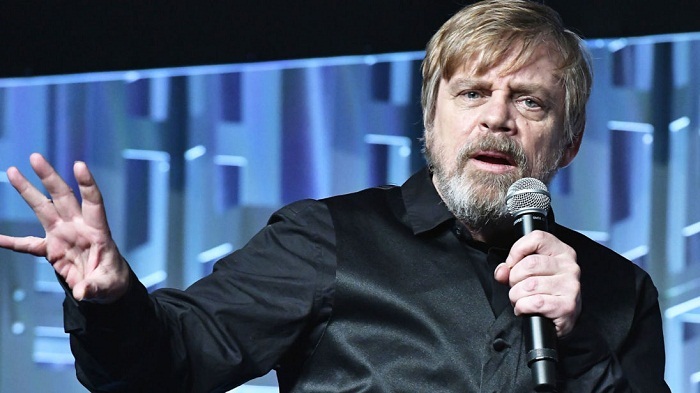 Hamill, who played Luke Skywalker in the original Star Wars and also features in the newer movies, frequently uses social media to interact with fans and has targeted heavy criticism at dealers on Twitter.